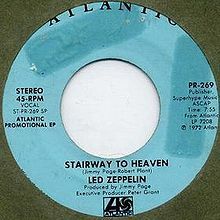 When my thirteen-year-old son told me his middle school dances always end with “Stairway to Heaven,” I wasn’t really taken by surprise. What else would a middle school dance end with? What kind of song could you play that will immediately let you know you still have seven minutes and change, for good or bad, before those unforgiving overhead fluorescents come on and you have to head out of the gymnasium, sweaty and deflated (either because the dance was never as good as you hoped or because it’s over and reality has hit once again—you are thirteen, with a greasy sheen to your skin that cannot be erased by even the best over-the-counter products provided by Osco Drug, you are wearing jeans that your mom cuffed instead of hemmed, certain you’d outgrow them in a week, or you are wearing jeans that you did outgrow almost the minute you walked out of the store and which now show the embarrassing flash of tube socks, yellowed from too many washings with bleach and too much frying in the dryer. You will slide into the back of your parents’ car, flooding the interior with the heady smell of sweat and anxiety that never ceases to ooze from your always slightly clogged pores). But even if you don’t want to slide into the backseat of that car and head home, seven minutes and change is an awfully long time at a middle school dance—excruciating whether you’re leaning against the wall, wishing you had someone to dance with and hoping the cuffs of your jeans don’t look as stupid as you know they do, or if you’re in the hands of a classmate, doing your best to step, turn, step, turn, and act as if the dance is no big deal, which isn’t too hard until the tempo picks up and you have no idea what to do. Let’s face it, “Stairway to Heaven” is a terrible song for dancing—it’s soft, it’s loud; it’s acoustic, it’s electric; it’s slow, it’s fast, it’s faster; it has recorders in it for goodness sake. So what to do? Stay clutched together and try to spin faster? Pull apart to dance, knowing you look like an idiot dancing fast because you’ve done it enough in front of your bedroom mirror at home to know how painfully bad you are, instead just wishing Page could rein in the solo at least once in his lifetime so you can get back to the part where it’s slow and your arms are once again lightly resting on the back of your partner? And after all isn’t this the best part of the slow dance in middle school, those hands on the back? This is where the boys can thrill at the idea that they are touching their first bra strap (not the strap itself of course, but the strap through a shirt and probably a sweater too, but they can feel it, they know it’s there, deep beneath their fingertips, full of mystery and possibility–and God forbid these girls’ bodies get any closer or who knows what could happen). And this is where the girls can wonder at how those boys who, five minutes before were joking with friends and jumping around the gymnasium, are now all staring stone-faced over their shoulders, gently stroking their backs with their large boy hands, because those girls are completely unaware of the power a bra strap felt beneath several layers of clothing can have over a middle school boy, and they are instead fascinated by the deep secrets they think are hidden in those quiet, stoic gazes that only boys seem capable of. Everyone is so painfully naïve that, to use the words of Robert Plant, it really does make you wonder. Next week? 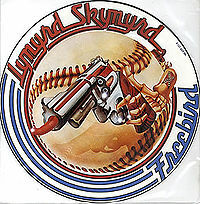 Lynyrd Skynyrd and the Art of the Slow Dance. Yeah you know what song I’ll be talking about. When I think of middle school dances, I think of Foreigner or Air Supply, but also the time I realized that only boys liked Rush. I don’t know any girls who listened to Rush, but somehow it made its way into the roller rink and the school dances. Rush is also really, really hard to dance to–slow, fast, or otherwise. You are absolutely right about Rush and boys–even the band knew it (and bemoaned that fact). I was told about an interview with Geddy Lee where he said something to the effect that they’d play concerts and he’d look out at the audience and it would be a sea of boys with maybe a few girls here and there who were usually up on someone’s shoulders “for their own protection,” and he said he just thought to himself, “What are we doing wrong?” I thought that was pretty funny. Yeah, Rush is one of those bands that messes with tempo too. You mess with the tempo, you don’t get on American Bandstand. I guess Rush and Led Zep didn’t have to worry about that. Who is the boy in the photo? I have no clue. I found it when I typed “middle school dance” into google images. Yes, it’s that easy. . . and of course it means the girl isn’t me!